Pictured are Pat Moore and Chad Jonsson. SYRACUSE — Syracuse Park Board and Parks Superintendent Chad Jonsson thanked David and Kathleen Johnston for David’s contribution and role he played in adding the new sign in front of the community center. The parks department received quite a few compliments about how nice it looks and stands out, creating a strong front for the building. 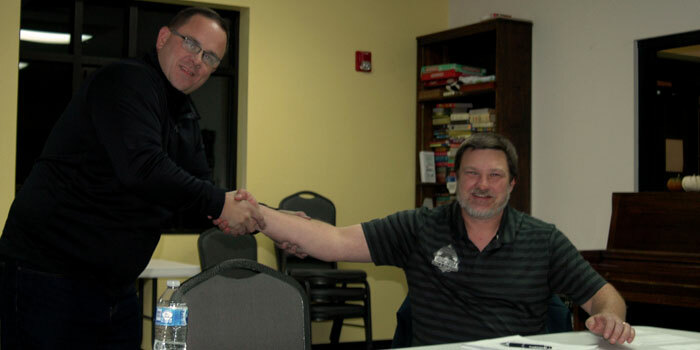 Pat Moore, representing Wawasee Kiwanis Club, appeared before the board to request permission to serve alcoholic beverages for the upcoming Wawasee Kiwanis Trivia Contest. Moore explained details of the event, how much profit is typically made and how Kiwanis has always followed the rules in the past with no problems. 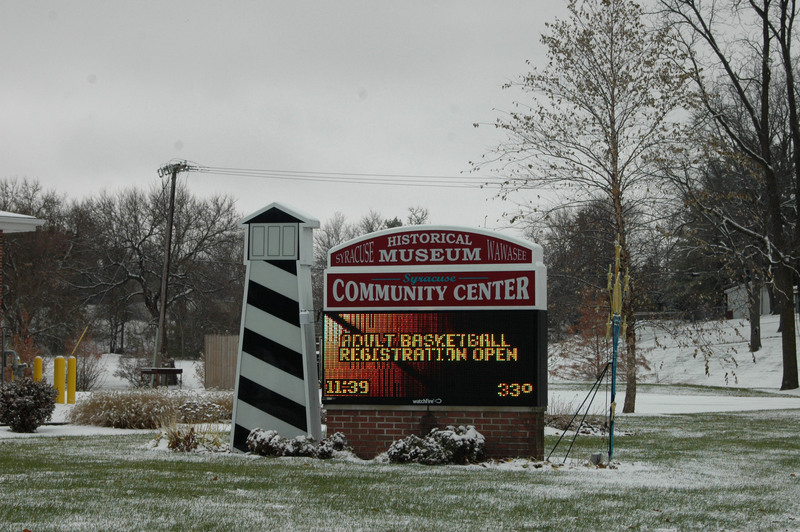 The new sign at the community center can now be easily viewed through light blizzards. The board approved of the club’s request. As the meeting proceeded, Mary Hursh commented on the fitness room’s increase in usage. Jonsson replied that, with Syracuse’s other fitness center closing down there has been an increase in registration for it. Johnston complimented the fitness room’s new flooring. 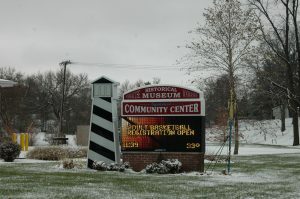 The fire marshal inspection of the community center addressed a couple issues, such as keeping doors in the center shut. While the inspection was passed, Jonsson said he would like to look at having magnetized doors at certain locations as there are only certain doors it would work on. The door would stay open but, in the event a fire alarm goes off, the door would shut similarly to the doors in the schools. With the evenings getting darker more quickly, some board members commented on how dark the community center’s parking lot is. Jonsson said they would look into creating some sort of lighting that would make the lot easier to navigate without disrupting the neighbors. Pickleball and judo continue on a regular basis. Registration for basketball is now open. Syracuse Holiday Magic will be from 5 to 7 p.m. Nov. 17, at Veterans Memorial Park at Crosson Mill. The evening will host musical entertainment, free cookies and cocoa, sleigh rides and a visit from Santa who will light the town Christmas tree. Letters to Santa can be dropped off at Santa’s mailbox in the community center lobby through Dec. 1. Breakfast with Santa will be from 8 to 11 a.m. Dec. 1, where kids can make a craft, have a pancake and sausage breakfast and finish their letter to Santa. Admission will be $3 for adults and free for kids. The next Pinterest Party at the community center will be Dec. 3, where attendants will get to make a string art Christmas tree for the holiday season. “Incredibles 2” will be playing at 6:30 p.m. Dec. 14, for the free movie night at the community center with a complimentary bag of popcorn. Those attending the movie are recommended to bring a chair or blanket.